Wooffles and Ice Cream Parfait at Wooffles & Cream! 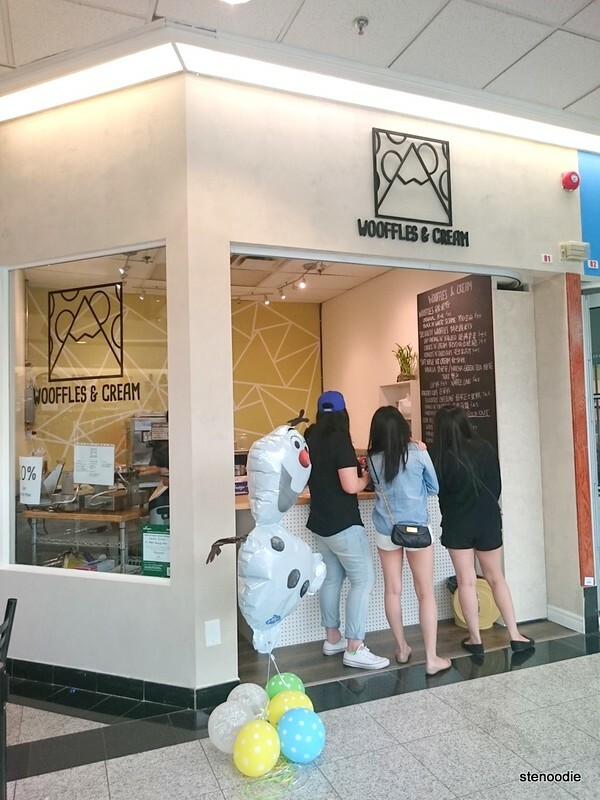 Remember last week when I blogged about and took pictures of a newly opened dessert shop called Wooffles & Cream at New Kennedy Square in Markham? 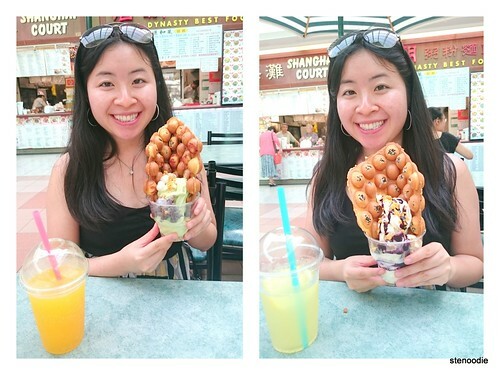 Well, they are officially open now (since July 8), and I got the chance to visit them to try their creations again in full size form! Wooffles & Cream has been a huge success so far from the looks of it because they sold out several times over this weekend. Mabel, one of the co-owners, had to go out to get more ingredients to make their Wooffles even though they had made 3 times the batch they usually make! They are exploding on social media with lots of customers taking pictures of their beautiful Wooffles and sharing it with friends. I got the chance to visit them again on a Sunday afternoon and was pleasantly surprised to find that they were sold out indeed once again! They were out of their Wooffles and Matchazuki so I tried their Mango ‘n’ Pineapple Parfait instead. 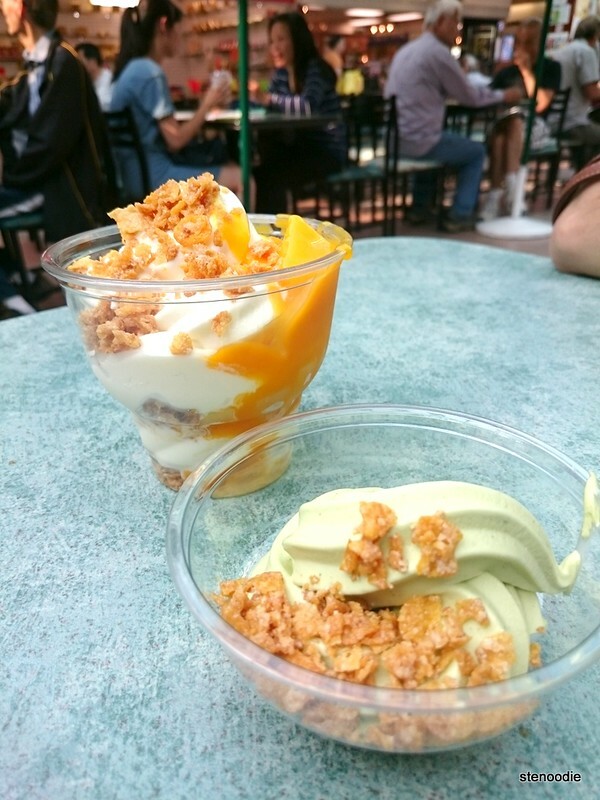 Their parfaits are made with their soft serve vanilla ice cream on a bed of crisp corn flakes, actual chunks of mango and pineapple pieces with juice (none of that canned stuff), and topped with more crunchy corn flakes. It is a beauty to behold and even more fun to eat! 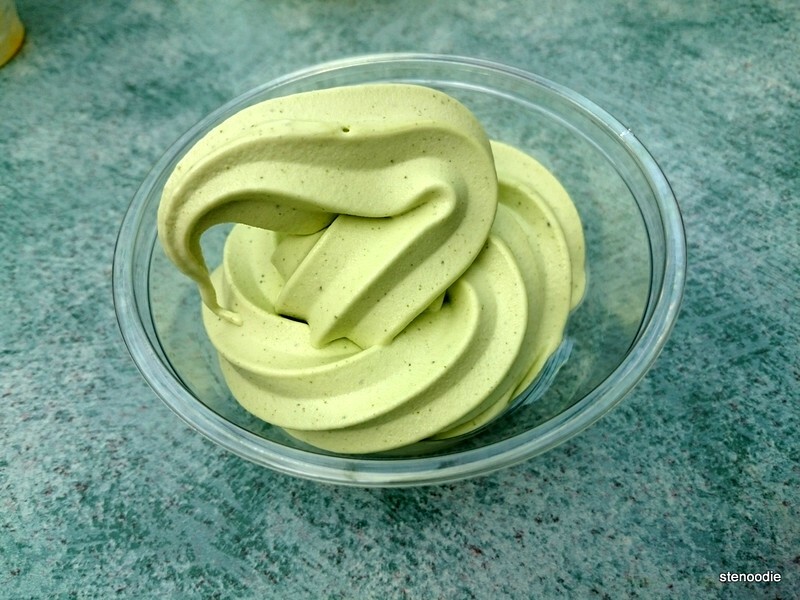 I also got a sample of their green tea ice cream! Yum! I really love their green tea ice cream because it’s so smooth and milky. 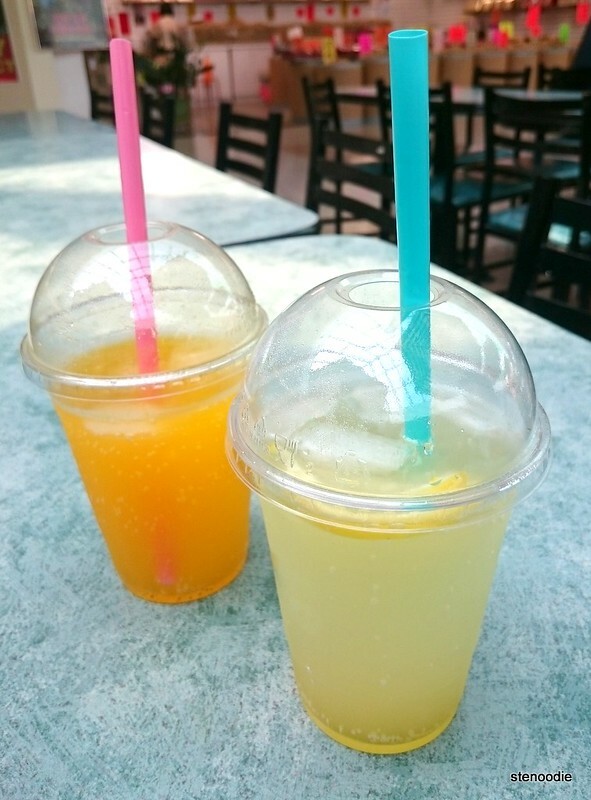 It tastes really good and is absolutely perfect on a hot summer day! 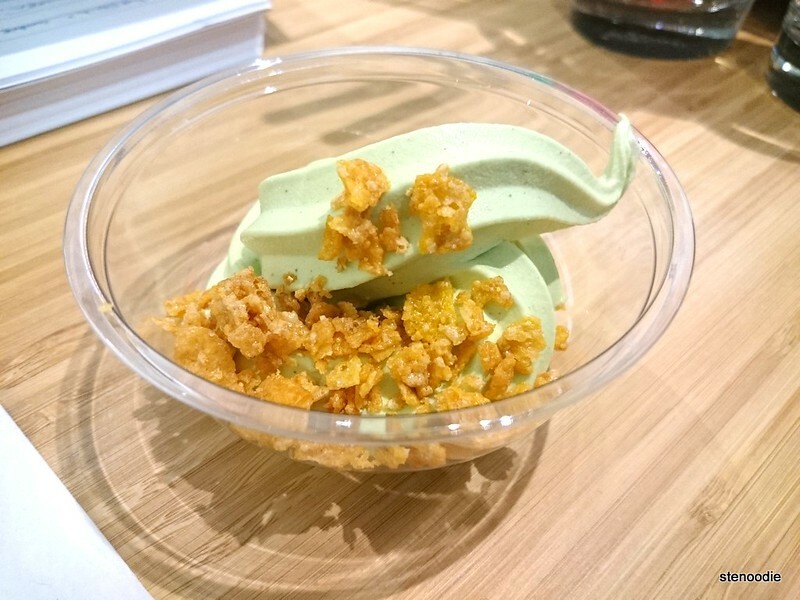 A sampling of their Matcha Green Tea Soft Serve Ice Cream without corn flakes — yum! 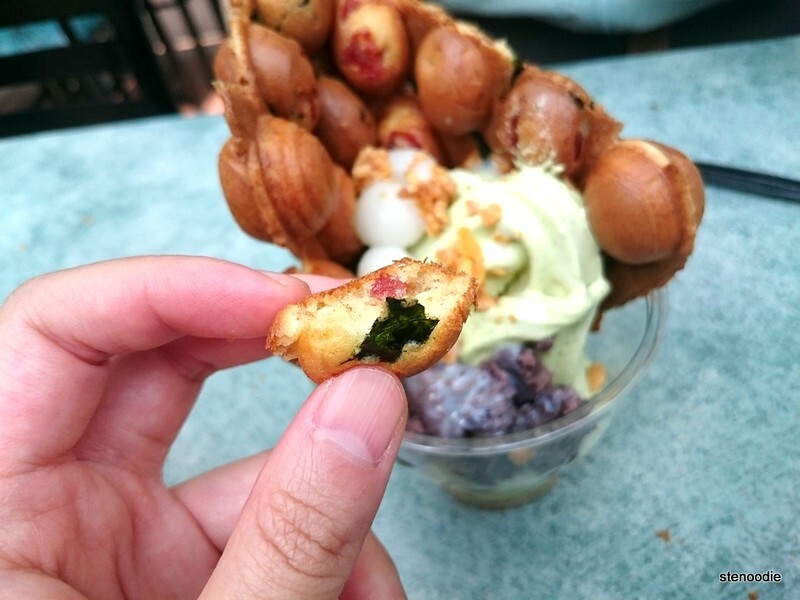 Each “bubble” of the Hong Kong-style egg waffle is infused with bits of Chinese sausage (called “lap cheong” in Cantonese) and dry seaweed. 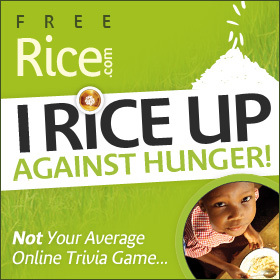 It is so unique and innovative! 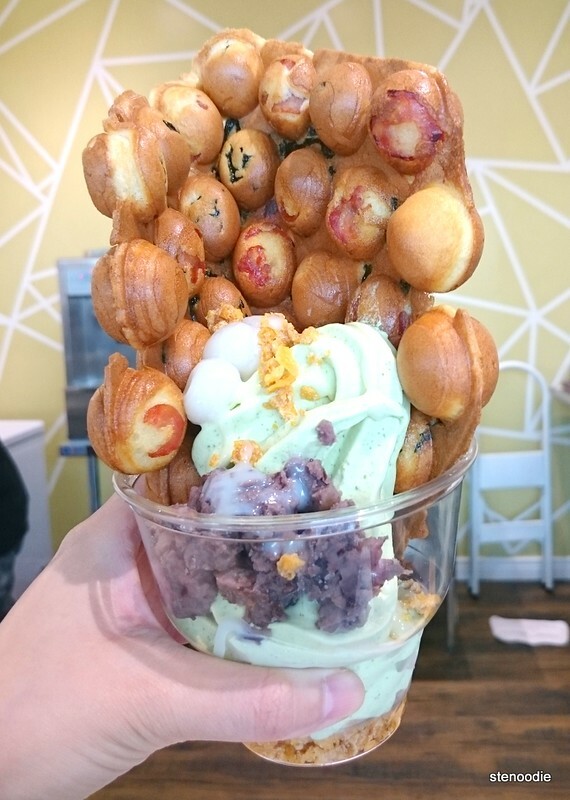 I asked for the Wooffle to be done together with the Parfait so I could photograph it and share what it looks like. 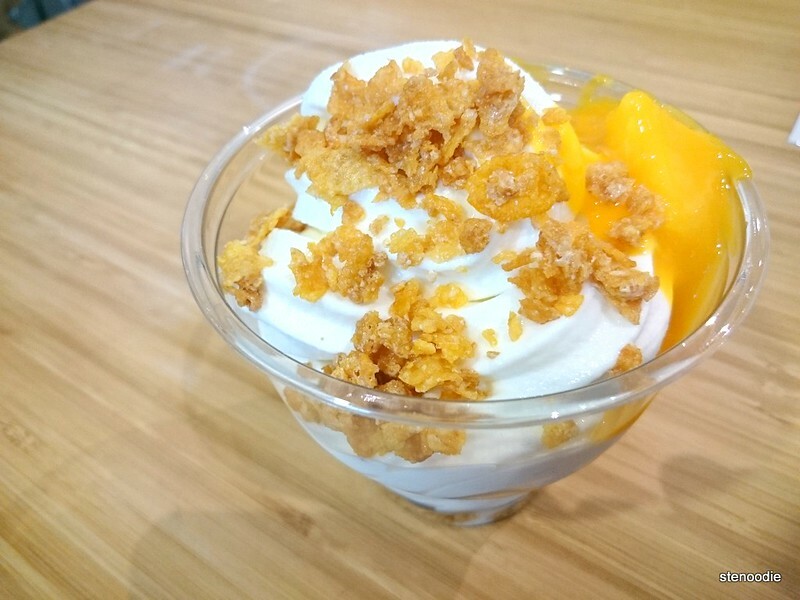 The Matchazuki parfait contains not only green tea ice cream but also homemade tong yuen, red bean, and corn flakes. After the photoshoots, it was time to eat it! We pinched off bubbles of the Wooffle and salivated at how delicious it was to eat each bubble. It contained a strong flavour of the lap cheong but paired so nicely with the eggy Wooffle. Delicious! I couldn’t get enough of it and we finished the Wooffle so quickly. I also liked the big flakes of seaweed that sometimes popped its head out when you pulled off a piece to eat. 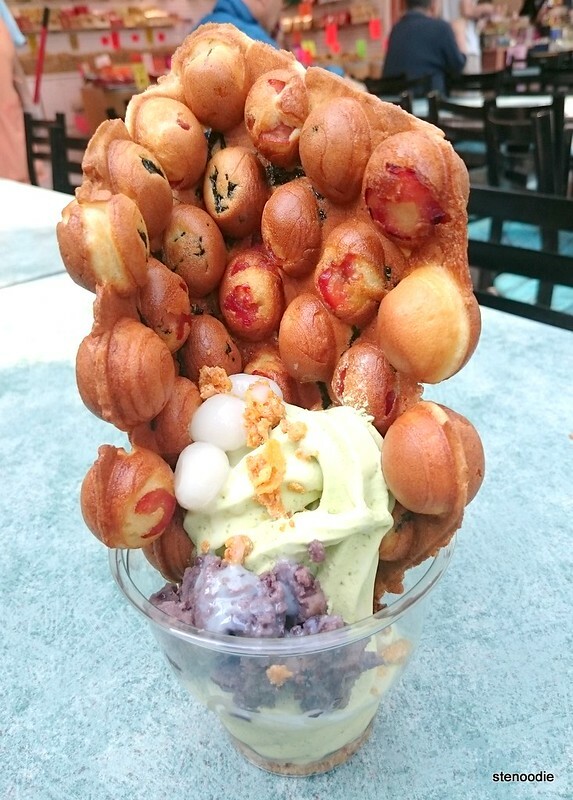 The Matchazuki was also great! 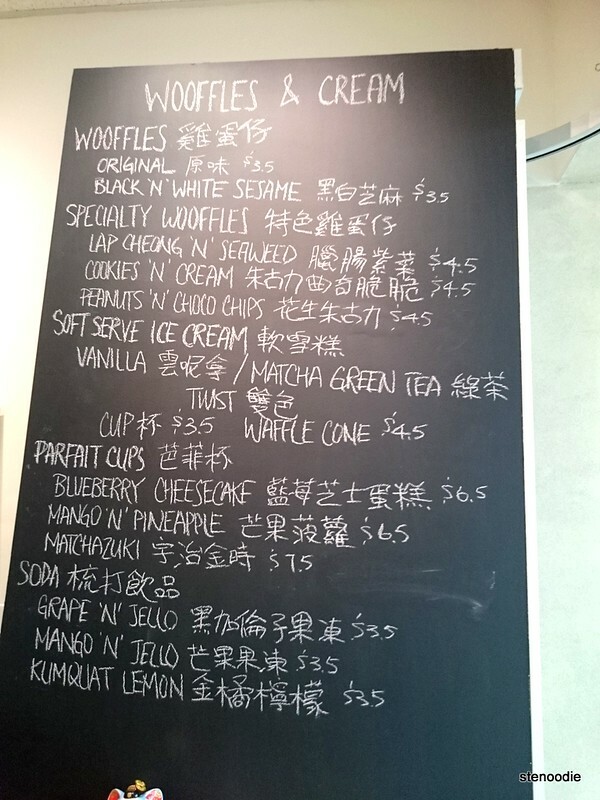 The green tea ice cream was smooth and creamy, the tong yuen was chewy, the red bean was a nice texture to the dessert, and the corn flakes were crispy. 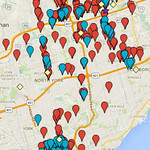 It is a big adventure for your taste buds because there is so much happening all at once! 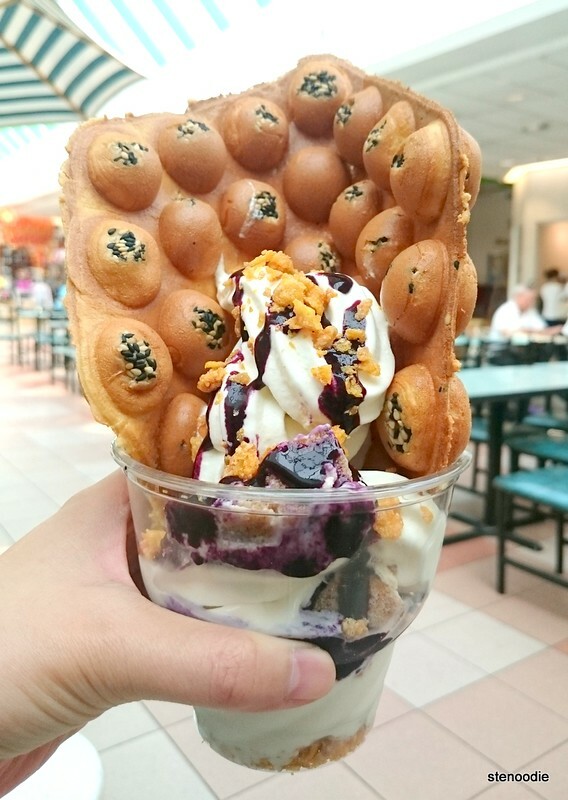 Salty and sweet Wooffle, crunchy corn flakes, mushy red beans, chewy tong yuen, cold ice cream, warm Wooffle — all amazing in one combination! The Mango ‘n’ Jello Soda was also very good. The soda was very refreshing and had a lot of fizz in it that kept it refreshing. It came in a big cup too with a thick straw. What I loved the most was the mango flavour because it was so strong that it was like you were drinking the juice of a freshly ripened mango. The jello bits were also a good addition to the taste buds. The Black ‘n’ White Sesame Wooffle is very good because each bubble contains some black and white sesame seeds. It is not as flavourful as the Lap Cheong ‘n’ Seaweed one for sure, but this Wooffle is very fragrant and delicious in a simple way. You can really taste the sesame seeds in the Wooffle. It is so fresh! We also tried the Kumquat Lemon Soda. This one had an extremely refreshing feel to it. 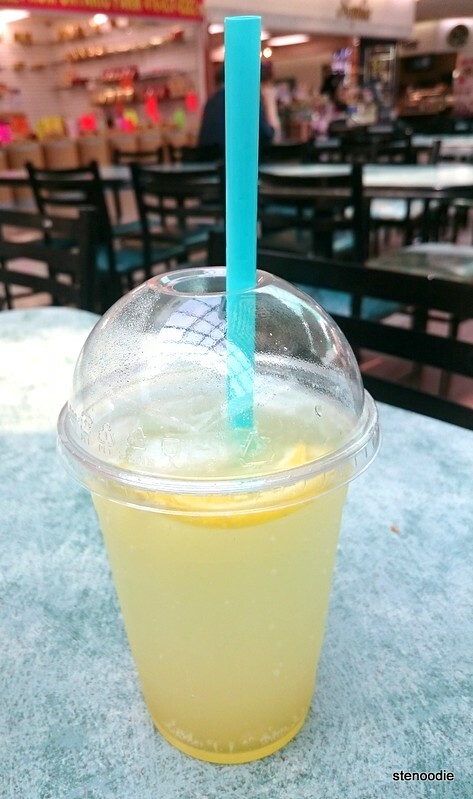 It is a great drink to get on a hot summer day after you’ve had too many meats since the lemon in it helps you to digest and the kumquat helps you stay hydrated and refreshed. I was impressed with how lemon-y the soda was. 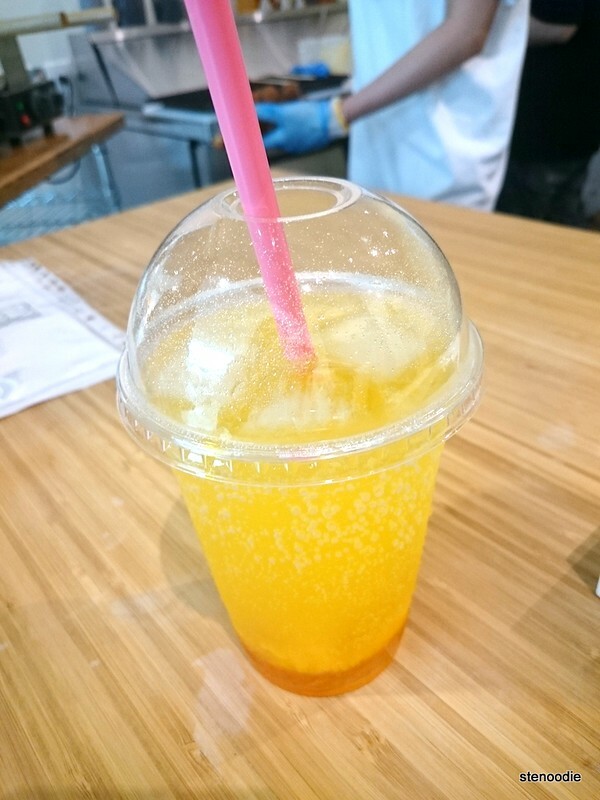 This soda was familiar to the Mango ‘n’ Pineapple one where it also has a lot of fizz — fun to drink! I tried their Grape ‘n’ Jello Soda last time. It was good! 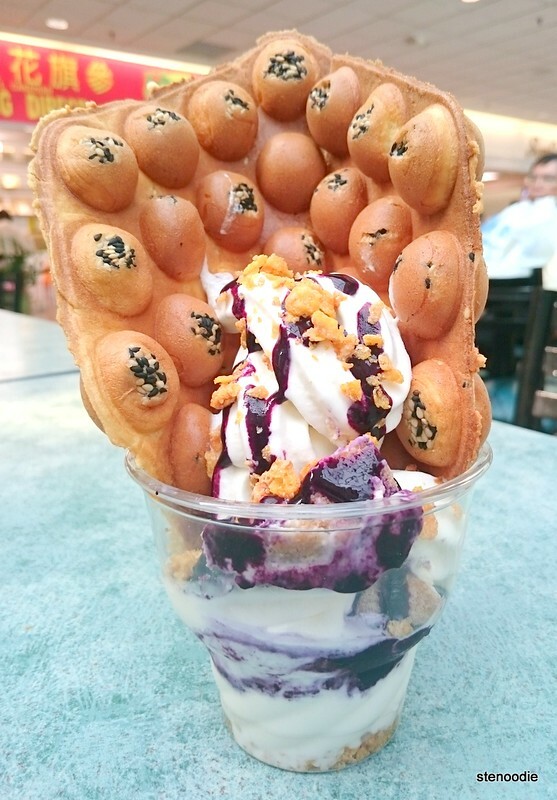 This entry was posted in Food and tagged 8360 Kennedy Road Unit 81, @woofflesncream, Black 'n' White Sesame Wooffle, Blueberry Cheesecake Parfait, creative, Dessert, egg waffles, food blog, food court, foodie, fun, Hong Kong style egg waffles, ice cream, Kumquat Lemon Soda, Lap Cheong 'n' Seaweed Wooffle, Mango 'n' Pineapple Parfait, Markham, Matchazuki, New Kennedy Square, newly opened, restaurant review, tong yuen, wooffle, Wooffles & Cream, Wooffles & Cream Cafe Inc.. Bookmark the permalink. 6 Responses to Wooffles and Ice Cream Parfait at Wooffles & Cream!